Manufactured on the same design principles as Red Valve’s Type A Valve, Series 2600 Miniflex Valves are the simplest and least expensive control valves available to industry today. The Series 2600 is designed with threaded end connections, enabling use on small lines (1/8”-2”).Miniflex Valves are pneumatically actuated, using the valve body as a built-in actuator. Air pressure opens and closes the rubber sleeve, eliminating costly actuators or electric motors and the accompanying maintenance costs. Only 25 psi over line pressure is required for closure. 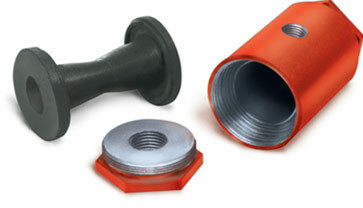 Threaded end connections enable easy installation and removal. The Miniflex Valve has only four parts and requires little or no maintenance. The valve cycles rapidly, making it ideal for sampling, filling, and controlling. The elastomer sleeve is molded and does not have fabric reinforcement, making it easier to open and close. The 2600 is also an excellent choice for chemical feeding, dry powder, bagging and plastic molding applications with controlling acids, slurries, reagents or catalysts.